Lamiwrap is a combination of woven PP and/or craft paper mixed with VCI as an option to avoid corrosion. Lamiwrap is available in different thicknesses and weight/m², depending on the handling and transport needs. 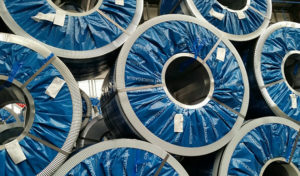 Lamiwrap is mainly used for manual packaging of coils and sheets that are used in connection with several types of edge protection in the Lamiedge range of products.